Breeders may have “conflicts” with vets on the topic of pet “needs”, BUT there are several areas of puppy/dog care that professional breeders and vets feel are “non-negotiable”! Breeders hear the stories from loving dog owners now dealing with cancer in their beloved pet, Vets see the all too common results from owners refusing to spay/neuter their pets. Not all pets have cancer issues as a result of owner negligence but all dogs DO have a healthier longer life when spay/neutering is done. Neutering will take away the “guard dog” instincts. NOT TRUE. Neutering a dog does not reduce its ability as either a guard or watch dog. They will still be as protective of their territory as they were before the surgery. Neutering makes pets fat. NOT TRUE. Neutering does not make your pet fat or lazy. Too much food and not enough exercise is the main causes of obesity. Neutering will hurt him. NOT TRUE. Neutering is a safe and relatively painless operation done by a veterinarian. Spaying should be done after one litter. NOT TRUE. It is actually better for her not to have a litter or a heat period before being spayed. Spaying will hurt her. UNTRUE! Spaying is safe and relatively painless operation done by a veterinarian. Spaying will make her fat. UNTRUE! Spaying will not make her fat or lazy. Rather, too much food and not enough exercise are the main causes of obesity. Early spay/neutering nearly eliminates breast cancer, and totally prevents uterine infections and uterine and testicular cancer. 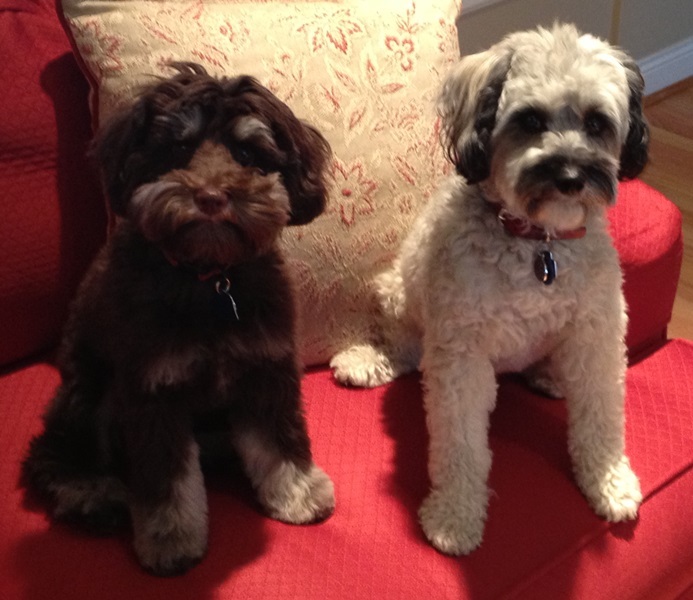 MY EXPERIENCE ON THIS SUBJECT: I raised 2 Schnoodle females to adults. I “allowed” the first season so I could determine when the “mixed” breed would cycle. Breeders have lots of history on purebred dog heat cycles but I wondered if the mix would be different. In BOTH cases, the girls came into heat at 8 ½ months of age. Granted, this is a very small sample size but I can offer this date as an approximation of when to expect a heat cycle. If you have a dog you feel has completed growth by age 8 months you should proceed with spaying. However, if you have a smaller/slower maturing/runt dog I would suggest you wait longer to allow for as much growth as genetically possible. Having your girl in season is NOT a big deal! They keep themselves very clean, and there is no personality change. Sometimes it is hard to “know” a girl is in season! The point is if you miss it or chose to miss it, don’t panic. The only inconvenience will be to make sure the dog is in a secure back yard or watched when she goes outside. A heat cycle lasts about 10 days. You will WAIT another 14 days then take the dog in for spaying. COST: find a “low cost” spay/neuter clinic or call the Humane Society for a list of vets that offer discounts. I searched for a local ‘LOW COST SPAY/NEUTER’ vet in Riverside. I pay $75. (2014). You can pay ANY price but spay/neuter services should not be expensive. Preparing for spay/neuter should not concern you. Take the food/water away the night before at about 8pm. 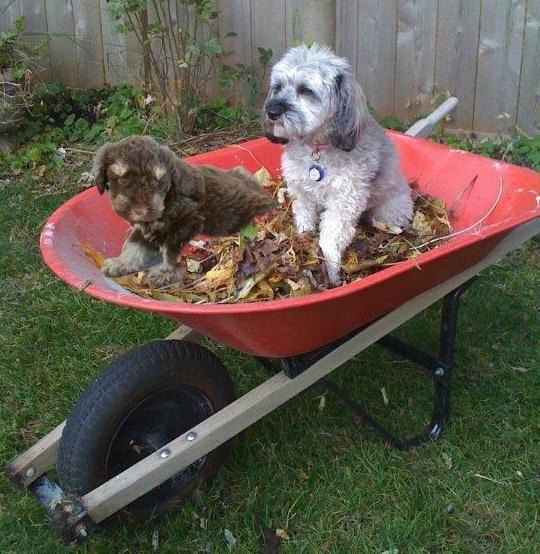 NEVER let the dog out of your site while it goes potty. Keep the dog caged for safety sake. Take the pup to the vet the next morning, usually around 8-9am. You can pick up the pup about 4pm. The pup may be a bit “wobbly” for a few hours. I put the pup out to go potty then offer water and food and encourage rest in the crate. The next day things will be back to normal! Easy as pie! I ALWAYS put my dogs on antibiotics and your vet will include this in your charge. Never allow a vet to tell you that antibiotics are not necessary, or say, “It was a clean surgery”. I lost a dog because I believed that statement. By the time the vet put the dog on antibiotics it was too late. Ten days later you return to have the ONE suture out in the case of neutering or TWO sutures out in the case of spaying. I can’t tell you how many spay/neuter surgeries I have had done. NEVER has a puppy needed a cone or pain medication. This is an unnecessary extra expense. Domineering alpha behavior occurs principally in females and is very uncommon in males. I can’t tell you how often a buyer proudly states, “I have read all the books. I know that I must be the ALPHA PACK LEADER when raising this pup”! I usually cringe and then ask what they intend to do, how they know the correct response for a given situation and/or what will they do when the problem issue reoccurs a short time later. Next, follows a lot of confusion and uncertainty regarding human intervention, and when to recognize at what point it should said reaction be carried out. When raising two female dogs, it is naïve to think that “human intervention” will change their behavior, and that the dog “will get over it”. Let me also make clear at the outset that spay/neuter will not affect alpha behavior. If it isn’t already clear, I dislike the word “alpha, and the way it is bantered around without knowledge as to its meaning and how to recognize it. With purebreds, alpha females are common. 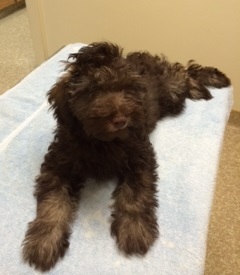 Usually the characteristics start to show when the pup is 5 months or older. This is why any knowledgeable breeder will convince you that one alpha female in a home is enough. If you want a second dog it must be a male! Over the years, I have always had several alpha females among my breeding population. They stand out with their bossy, imposing personalities. Problems arise when they want to make sure any female they share space with understands who is first at the food dish, who gets handled first, who goes in and out the dog door first. On and on goes the list of the alpha female rules for another dog she shares space with. They will constantly intimidate a quiet, gentle female. This quieter dog will always have to give up her bed when the alpha approaches or she will have to walk away from a chew toy. I have seen the alpha female actually change the personality of the “gentle” dog. When you research the well-known DOG authors their approach is often a response to the “problem” they have been asked to assess and handle. Before you swear off female dogs completely let me share the “how” and “why”. First, I should say that my alpha females are loving devoted dogs. They DO like a playmate/companion BUT it MUST be a male! “Guy dogs” just don’t care or seem to register when they are being bossed around. They just walk away or ignore it——-by now every man reading this is smiling! When someone calls wanting a friend for their current female dog I always ask, “What is the personality of your dog”? I feel an instant urge to defend their dog when the buyer states any of the following: “She is a confident and loving dog”, “I know she will do fine with a companion”, “I have noticed her interest in other dogs when we go out for a walk”, “We have spoiled her so she’s possessive about toys that she sees as hers”, “She is the best dog I have ever owned. Sure she is strong willed, but that is what I like about her”. Buyers often interpret the term “alpha” as a bad word, meaning that this female will attack another dog or draw blood at the first threatening sign of a possible friendship between another dog and “her” owners. This is NOT the case. You already know your dog is “alpha”, BUT you love her and only see the way she returns love to you. I am not asking you to change your feelings. I AM ONLY ASKING that you be honest about your female’s personality! I don’t do this so you will feel the need to defend her. I do this to help you make the best decision when purchasing a companion for her. Alpha females LOVE a friend. I see it all the time. They want to play and have a nurturing relationship with another dog. I see the two of them curled up together taking naps and rough housing in a fun way. I think the biggest problem with an alpha female is HER owners who have trouble being honest when trying to select a companion for her. You live with the dog, ASSESS her correctly and a breeder can always suggest the perfect companion for her. Based on my experience, I believe that alpha females are born that way. There is nothing you can do to change them and they cannot help their dominant behavior patterns. Yes, you can stand there, take the “alpha human pose” and deal with a situation you have witnessed. BUT there will be dozens of other incidents that you won’t see and the outcome will always favor the dominant dog. The looser will always be the sweet matured quiet dog. I have watched an alpha female silently lift her lip to another dog because she knew I was close by! They develop subtle patterns of behavior to “please and satisfy” the owner. That illustrates how smart they are! Believe me, this will not go away. It can only be controlled if you are constantly on top of it, all day and every day. Otherwise, make the decision to have only the alpha dog. My Puppy Package has complete information on how to raise your pup. I have raised a lot of pups. I love it and plan to continue It is essential that the pups have a respect for me, my home and the things in it. You will begin training your pup within a few weeks of taking it to your home. I provide a timeline in order that the education of your pup is appropriate for its age and maturity. The trick is to be consistent, keep it simple and don’t allow the pup to have an “opinion”! This probably sounds a lot like the way you are raising your well behaved children. 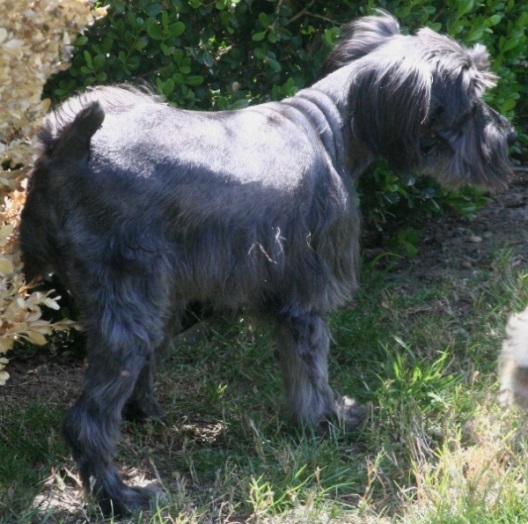 Meet Sofie the Schnauzer: she needed a friend BUT she had an “alpha” personality. 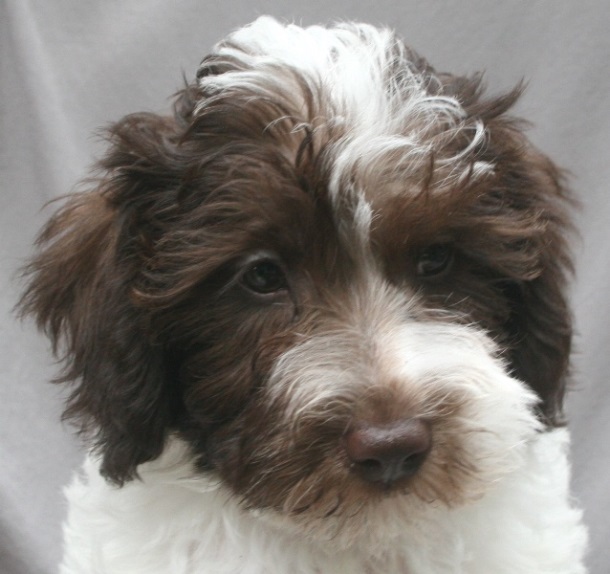 I suggested a male Schnoodle— enter LEO. 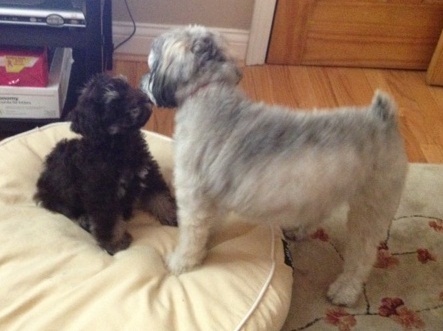 Note Sofie’s stance at their first meeting! Leo, being an easy going kinda guy and somewhat younger was quick to fall into line! Following my instructions for INTEGRATION OF ANOTHER DOG, the two became best friends. Alpha behavior is common in purebreds. I have to say that in all my years of breeding Schnoodles, the girls tend to be as mellow, and loveable as the boys. 3 legs down can only mean one thing! see the “pee” just behind the leg she is “lowering”? So why do dogs pee in a new home? CONFIDENCE: plain and simple. Think about it……….puppy or dog enters a new home. Although the animal is licking you and appearing eager to be your best friend it is normal and natural for him/her to be scared. Nothing is familiar. Nothing makes the dog comfortable and it lacks confidence that this is a “safe” place to be. No amount of hugging, or cooing, or talking will eliminate the underlying sense of fear. This is a strange place and pup is nervous. 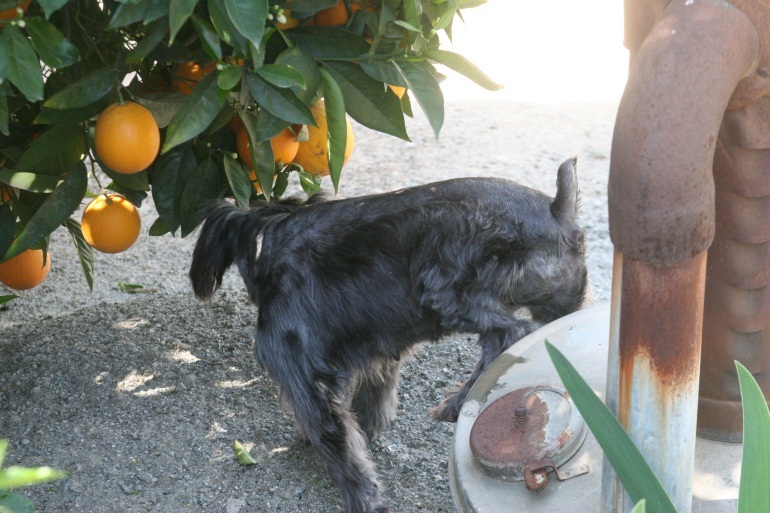 Instinct tells the pup/dog to put his/her smell down immediately. You will also see this behavior when you have nice new carpet put in your home. Your older perfectly mannered dog, completely housetrained, will go into the middle of the new carpet and go potty! END of new strange smell! Throughout this site I explain over and over how important it is NOT to stress your new pet and how to instill confidence. I also tell you NEVER trust your new four legged friend! Hopefully, you will turn your thinking to “how you can pre-anticipate” a problem and take necessary precautions. After all, humans think, animals act on instinct. For those who absolutely MUST have a female I say, “Get one”. My only advice is that IF you already have a female you MUST think carefully before adding a second female. This is a recipe for trouble if female #2 hits age 6 months and displays an “alpha” personality. You can’t foresee this when you take your 8 week old pup home. It shows up with maturity. Even if female #1 is an easy going dog, don’t presume that female #2 will have the same nature.